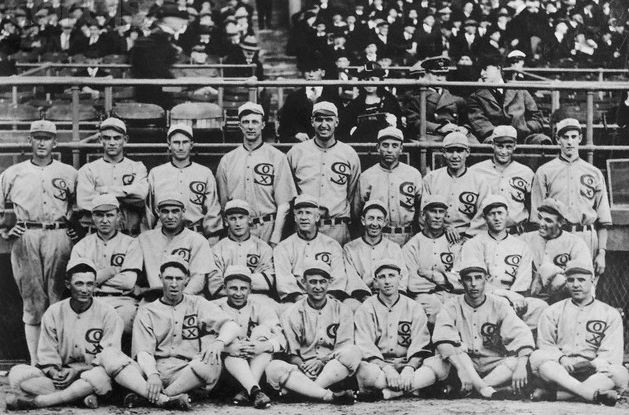 Group shot of the 1919 White Sox. They would after this year be known as the "Black Sox Scandal" team, due to the allegation that eight members of the team accepted bribes to lose the 1919 World Series to the Cincinnati Reds. These eight players, pitchers Eddie Cicotte and Claude "Lefty" Williams, first baseman Charles "Chick" Gandil, shortstop Charles "Swede"Risberg, third baseman George "Buck" Weaver, outfielders Joe "Shoeless Joe" Jackson and Oscar "Happy" Felsch, and pinch hitter Fred McMullin, were banned from the game of baseball for life.